Home » Russian Food » What Do Russians Eat for Their Daily Breakfast? Here are the Answers! A healthy breakfast is essential for starting off the day. It is often described as the most important meal of the day. However, many people rush through their morning routines and fail to prepare their breakfast. Little did they know, skipping breakfast means skipping out on essential nutrients and benefits that can improve their day. 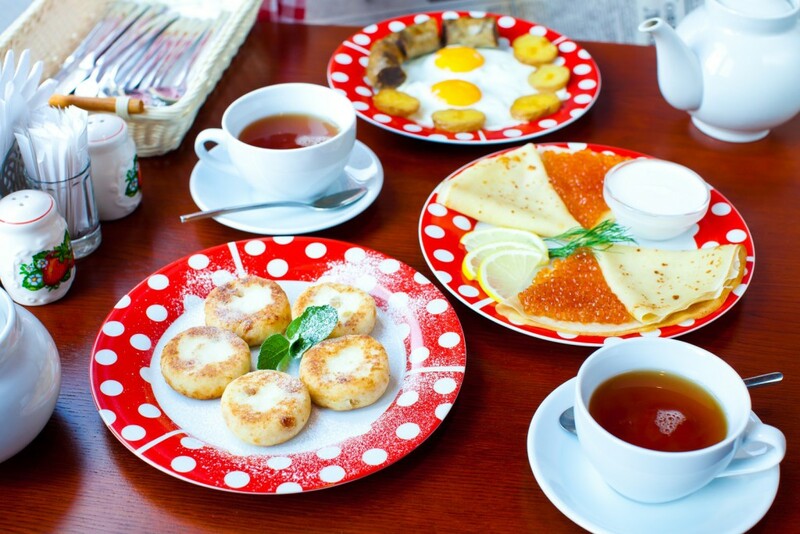 Russian people believe that eating a full breakfast is a good habit. However, when they undergo such a long winter night, they tend to wake up to go to work when it is still dark and there is always a temptation to snooze. As a result, they opt for additional minutes of sleep and just have a cup of coffee or tea and a typical fast breakfast as they hurry to get to work on time. Maybe you can adopt their typical fast breakfast menu to start the day, as well as save your morning time. So, what do Russians eat for their daily breakfast? Here are the answers! Rye bread is one of the products that offers a viable alternative to Russian people who are looking for a nutritious snack without sacrificing the sandwiches. It becomes one of the most common foods on the Russian breakfast table. Rye bread is usually served with butter and sliced sausages topple over it. Somehow, it looks like an open-faced sandwich, although the name is really too ornate for what it actually looks like. Sometimes they call rye bread as black bread for the color is brown. It has a strong, sweet flavor, and is quite tough, unlike typical white bread that is particularly soft. Sometimes, some Russian families do eat white bread, but it is rare to see whole-wheat bread on a Russian family table. Aside from breakfast, you can also eat it for every lunch and every dinner of everyday, and still never get tired of it. The most mainstream way to prepare eggs in the morning is to fry them. People do that a lot. Russians like fried omelets, but it takes some time to beat the eggs and they might not have any milk in the fridge. So, the easiest and fastest way to prepare the eggs is to fry them. They usually like to leave the yolks unbroken, because that way, it will look like the eggs have eyes. Russians call it glazunya which is derived from the word glaz. Glaz means eye. Some other Russians also enjoy scrambled eggs. It is usually not served with hash browns as is typical in Americans’ breakfast table. The scrambled eggs are normally eaten alone or with bread. Some Russian people also put mayonnaise on their eggs, but, sometimes ketchup will do, too. Russian pancake, also known as blini, is about the same size as French crepes, though Russian pancake is more substantial. It is less thick than Dutch pannekoeken and much thinner and wider than American-style pancakes. Russian people like their pancakes served with butter, sour cream, jam, or caviar. There are dozens of recipes for Russian pancakes and almost every Russian housewife has their own variations. From the earliest days of childhood, Russian people−especially children−eat a lot of porridge of many different kinds such as buckwheat, oatmeal, millet, and even a so-called milk soup with noodles. But, the porridge that is the most loved for breakfast is semolina porridge. Sometimes, they eat it with jam or fruit. It is so tasty! Even today, it is still one of the most popular breakfasts at home, kindergartens, schools, and canteens. It is similar to pancakes, flavored with sour cream, marmalade, jams, honey or apple sauce. Sometimes it is embellished with raisins. In Russia it is also known as tvorozhniki, and consists of cheese, flour, eggs, and sugar. Fun fact: It is a specialty of humble origins, born first as a breakfast typical of the poorest peasant families who could rely only on their own dairy products; hence people also call it peasant fritter. However, it is soon spread even among the highest social classes. It is really fast and easy to make. The best way to serve syrniki is right from the pan, but it is still delicious even after a couple days in the fridge and it can reheat nicely. Other than breakfast, it is also used in desserts and stuffed into dumplings and pies. Grenki is made of stale bread, so if you have got some stale bread, do not throw it away. Moreover, according to Russian superstitions, throwing bread away even when it goes stale is considered bad luck. It is better to feed it to the birds which in Slavic culture; birds embody the souls of the dead. Grenki is a very appetizing yet simple dessert that even a child can make it for their own breakfast, as long as they know how to turn on the stove. Grenki can be made in various ways, and of different kinds of bread. Grenki can either be fried or baked in the oven. Grenki can also be made sweet or savory by adding seasonings, vegetables, fruit, meat, cheese, and other things. The choice of options is simply open! Sharlotka or Russian apple cake is a perfect breakfast in the fall when you have lots of apples and do not have to be hurry. It is wonderful to have it with a cup of morning tea or as an afternoon snack. This cake is so traditional; just about every Russian wife knows it and knows how to make it. It is so easy and has few simple ingredients. If you are looking for a cake which is light and fluffy enough to serve at your breakfast table, then go for sharlotka. Now, what do you think about Russian daily breakfast? I am sure that you will love it too, if you try it.